Replicating the beauty of natural wood, Titan Cedar Shake comes in multiple widths and thicknesses to achieve the aesthetics of shake roofing. The multi-colored option is ideal to get an aged or “weathered” look. 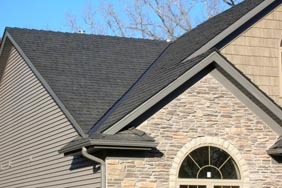 Titan Roof Systems offer Class A or C fire rating, and are hail resistant with a Class 4 rating. These ratings are the highest in the roofing industry and provide an excellent alternative roofing option for those seeking the character of cedar shake and need the assurance of a tested product. Specifications for Titan Shake recommended exposure at 10" but this may be adjusted to a lower measurement if desired or if a staggered application is used to achieve a rugged appearance. Height 23" ± ⅛" 23" ± ⅛"